We were going to continue on prayer, but this week I instead taught about His love and blessing overflowing from us to others. Next week we should be back on track. Prayer is a confident dependent trust. Listen in, as we begin this week and next week, to look at God’s love in prayer. As we pray, we can’t pump anything up and make it happen. Your efforts are not necessary! But we can align with what has already been accomplished in the timeless realm of eternity. We are simply agreeing with what has already been accomplished on the cross, and lining up the earth with the Heavenly answer. 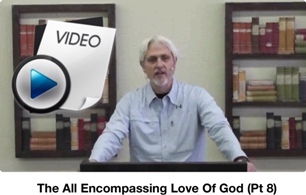 The All Encompassing Love Of God (Pt 8) God Resides In You! In Christ dwells the fullness of the Godhead bodily, Col 2:9. In this message we discover the power of God living in us, and one with us, and what awesome power He has placed within man. We realize this especially when we recognize what Jesus has done for us at the cross. Be mesmerized and maybe even a little shocked as you discover what this means! Posted on February 2, 2015 October 26, 2016 Author EvanCategories Grace Audio/Video MessagesLeave a comment on The All Encompassing Love Of God (Pt 8) God Resides In You!